Transcription factor (TF) proteins are master regulators of transcriptional activity and gene expression. TF-based gene regulation is an essential approach for many biological applications such as stem cell differentiation and cellular programming, however, several limitations hinder the full potential of TFs. To address this challenge, researchers in Prof. KiBum Lee’s group (Sahishnu Patel and Perry Yin) developed an artificial, nanoparticle-based transcription factor, termed NanoScript, which is designed to mimic the structure and function of TFs. NanoScript was constructed by tethering functional peptides and small molecules called synthetic transcription factors, which mimic the individual TF domains, onto gold nanoparticles. They demonstrated that NanoScript localizes within the nucleus and initiates transcription of a targeted gene with high efficiency. Moreover, NanoScript can effectively transcribe targeted genes on endogenous DNA in a non-viral manner. NanoScript is a functional replica of TF proteins and a tunable gene-regulating platform. NanoScript has two attractive features that make this the perfect platform for stem cell-based application. First, because gene regulation by NanoScript is non-viral, it serves as an attractive alternative to current differentiation methods that use viral vectors. Second, by simply rearranging the sequence of one molecule on NanoScript, NanoScript can target any differentiation-specific genes and induce differentiation, and thus has excellent prospect for applications in stem cell biology and cellular reprogramming. This work was recently published in ACS Nano (DOI: 10.1021/nn501589f) and was selected to be highlighted by the following magazine (C&EN) and blogs (Nanowerk and UCSD). ACS Nano, a publication of the American Chemical Society (ACS), has published Lee’s research on NanoScript (“NanoScript: A Nanoparticle-Based Artificial Transcription Factor for Effective Gene Regulation”). The research is supported by a grant from the National Institutes of Health (NIH). Biologists have been enhancing expression of specific genes with plasmids and viruses for decades, which has been essential to uncovering the function of numerous genes and the relationships among the proteins they encode. However, tools that allow enhancement of expression of endogenous genes at the transcriptional level could be a powerful complement to these strategies. Many chemical biologists have made enormous progress developing molecular tools for this purpose; recent work by a group at Rutgers suggests how nanotechnology might allow application of this strategy in living organisms, and perhaps one day in patients. 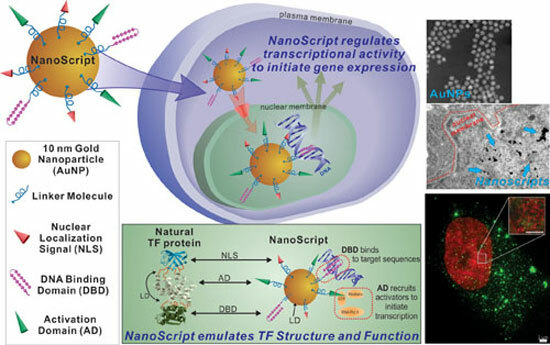 In a paper published in ACS Nano, researchers led by KiBum Lee synthesized gold nanoparticles bearing synthetic or shortened versions of the three essential components of transcription factors (TFs), the proteins that “turn on” expression of specific genes in cells. Specifically, polyamides previously designed to bind to a specific promoter sequence, transactivation peptides, and nuclear localization peptides were conjugated to the nanoparticle surface. These nanoparticles enhanced expression of both a reporter plasmid (by ~15-fold) and several endogenous genes (by up to 65%). This enhancement is much greater than that possible using previous constructs lacking nuclear localization sequences; the team incorporated a high proportion of those peptides to ensure efficient delivery to the nucleus. Diagram of the synthetic TF mimic (termed NanoScript). Decorated particles are ~35 nm in diameter. Letters are amino acid sequences; Py-Im, N-methylpyrrole-N-methylimidazole. These nanoparticles offer an alternative to delivering protein TFs, which remains extremely challenging despite considerable effort towards the development of delivery systems that transport cargo into cells. Among other barriers to the use of native TFs, incorporating them into polymeric or lipid-based carriers often alters their shape, which would likely reduce their function. While the group suggests future generations of these nanoparticles might one day be used to treat diseases caused by defects in TF genes, many questions remain. First, the duration of gene expression enhancement is not known; the study only assesses effects at 48 h post-administration. Further, whether gold is the best material for the core remains unclear, as its non-biodegradability means the particles would likely accumulate in the liver over time; synthetic TFs with biodegradable cores might also be considered. Patel S et al., NanoScript: a nanoparticle-based artificial transcription factor for effective gene regulation,ACS Nano 2014; published online Sep 3. The interface between the implant and host bone plays a key role in maintaining primary and long-term stability of the implants. Surface modification of implant can enhance bone in growth and increase bone formation to create firm osseo integration between the implant and host bone and reduce the risk of implant losing. This paper mainly focuses on the fabricating of 3-dimensiona interconnected porous titanium by sintering of Ti6Al4V powders, which could be processed to the surface of the implant shaft and was integrated with bone morphogenetic proteins (BMPs). The structure and mechanical property of porous Ti6Al4V was observed and tested. Implant shaft with surface of porous titanium was implanted into the femoral medullary cavity of dog after combining with BMPs. The results showed that the structure and elastic modulus of 3D interconnected porous titanium was similar to cancellous bone; porous titanium combined with BMP was found to have large amount of fibrous tissue with fibroblastic cells; bone formation was significantly greater in 6 weeks postoperatively than in 3 weeks after operation. Porous titanium fabricated by powders sintering and combined with BMPs could induce tissue formation and increase bone formation to create firm osseo integration between the implant and host bone. Nanomaterials research has in part been focused on their use in biomedical applications for more than several decades. However, in recent years this field has been developing to a much more advanced stage by carefully controlling the size, shape, and surface-modification of nanoparticles. This review provides an overview of two classes of nanoparticles, namely iron oxide and NaLnF4, and synthesis methods, characterization techniques, study of biocompatibility, toxicity behavior, and applications of iron oxide nanoparticles and NaLnF4nanoparticles as contrast agents in magnetic resonance imaging. Their optical properties will only briefly be mentioned. Iron oxide nanoparticles show a saturation of magnetization at low field, therefore, the focus will be MLnF4 (Ln = Dy3+, Ho3+, and Gd3+) paramagnetic nanoparticles as alternative contrast agents which can sustain their magnetization at high field. The reason is that more potent contrast agents are needed at magnetic fields higher than 7 T, where most animal MRI is being done these days. Furthermore we observe that the extent of cytotoxicity is not fully understood at present, in part because it is dependent on the size, capping materials, dose of nanoparticles, and surface chemistry, and thus needs optimization of the multidimensional phenomenon. Therefore, it needs further careful investigation before being used in clinical applications. Background – Cell membrane interactions rely on lipid bilayer constituents and molecules inserted within the membrane, including specific receptors. HAMLET (human α-lactalbumin made lethal to tumor cells) is a tumoricidal complex of partially unfolded α-lactalbumin (HLA) and oleic acid that is internalized by tumor cells, suggesting that interactions with the phospholipid bilayer and/or specific receptors may be essential for the tumoricidal effect. This study examined whether HAMLET interacts with artificial membranes and alters membrane structure. Methodology/Principal Findings – We show by surface plasmon resonance that HAMLET binds with high affinity to surface adherent, unilamellar vesicles of lipids with varying acyl chain composition and net charge. Fluorescence imaging revealed that HAMLET accumulates in membranes of vesicles and perturbs their structure, resulting in increased membrane fluidity. Furthermore, HAMLET disrupted membrane integrity at neutral pH and physiological conditions, as shown by fluorophore leakage experiments. These effects did not occur with either native HLA or a constitutively unfolded Cys-Ala HLA mutant (rHLAall-Ala). HAMLET also bound to plasma membrane vesicles formed from intact tumor cells, with accumulation in certain membrane areas, but the complex was not internalized by these vesicles or by the synthetic membrane vesicles. Conclusions/Significance – The results illustrate the difference in membrane affinity between the fatty acid bound and fatty acid free forms of partially unfolded HLA and suggest that HAMLET engages membranes by a mechanism requiring both the protein and the fatty acid. Furthermore, HAMLET binding alters the morphology of the membrane and compromises its integrity, suggesting that membrane perturbation could be an initial step in inducing cell death.